Low carb vs. low fat diet research produces some real doozies in poor scientific thinking. The latest study, published in a reputable scientific journal, showed no difference in comparative weight loss between the two diets. The authors instead offered some mumbo jumbo about the so-called cardiovascular benefits of a low carb diet. These comments simply repeated old old dogma from flawed thinking that has been around for at least a century. Source: Ann Intern Med. 2010 Aug 3;153(3):147-57. Title: Weight and metabolic outcomes after 2 years on a low-carbohydrate versus low-fat diet: a randomized trial. Mohammed BS, Miller B, Rader DJ, Zemel B, Wadden TA, Tenhave T, Newcomb CW, Klein S.
The lead author, Gary D. Foster, is a professional psychologist. His expertise involves behavioral modification for treating obesity. The research article cited above was supported by grants from the National Institutes of Health (i.e., taxpayers). He has one professional book at Amazon (Managing Obesity: A Clinical Guide). Have you ever heard the expression that people look for evidence to support what they already believe? Scientists, being human, do the same thing. Some researchers have spent their entire careers doing experiments that give results in support of a pet hypothesis. I speak of this from experiences – mine as well as those of my colleagues. Now, with that said, let’s take a look at this study and see what Dr. Foster and his colleagues discovered. loss. OBJECTIVE: To evaluate the effects of 2-year treatment with a low-carbohydrate or low-fat diet, each of which was combined with a comprehensive lifestyle modification program. DESIGN: Randomized parallel-group trial. (ClinicalTrials.gov registration number: NCT00143936) SETTING: 3 academic medical centers. PATIENTS: 307 participants with a mean age of 45.5 years (SD, 9.7 years) and mean body mass index of 36.1 kg/m(2) (SD, 3.5 kg/m(2)). INTERVENTION: A low-carbohydrate diet, which consisted of limited carbohydrate intake (20 g/d for 3 months) in the form of low-glycemic index vegetables with unrestricted consumption of fat and protein. After 3 months, participants in the low-carbohydrate diet group increased their carbohydrate intake (5 g/d per wk) until a stable and desired weight was achieved. A low-fat diet consisted of limited energy intake (1200 to 1800 kcal/d; less than or=30% calories from fat). Both diets were combined with comprehensive behavioral treatment. MEASUREMENTS: Weight at 2 years was the primary outcome. Secondary measures included weight at 3, 6, and 12 months and serum lipid concentrations, blood pressure, urinary ketones, symptoms, bone mineral density, and body composition throughout the study. RESULTS: Weight loss was approximately 11 kg (11%) at 1 year and 7 kg (7%) at 2 years. There were no differences in weight, body composition, or bone mineral density between the groups at any time point. During the first 6 months, the low-carbohydrate diet group had greater reductions in diastolic blood pressure, triglyceride levels, and very-low-density lipoprotein cholesterol levels, lesser reductions in low-density lipoprotein cholesterol levels, and more adverse symptoms than did the low-fat diet group. The low-carbohydrate diet group had greater increases in high-density lipoprotein cholesterol levels at all time points, approximating a 23% increase at 2 years. LIMITATION: Intensive behavioral treatment was provided, patients with dyslipidemia and diabetes were excluded, and attrition at 2 years was high. CONCLUSION: Successful weight loss can be achieved with either a low-fat or low-carbohydrate diet when coupled with behavioral treatment. A low-carbohydrate diet is associated with favorable changes in cardiovascular disease risk factors at 2 years. PRIMARY FUNDING SOURCE: National Institutes of Health. The first result that stands out for me is that, after 2 years, weight loss was the same on both diets – i.e., 11 kg (11 percent) after 1 year and 7 kg (7 percent) after 2 years. Considering that the starting point was measured as BMI (avg. of 36.1), comparing this with a weight loss result is like comparing apples and oranges. If we can instead assume a valid transposition of percentages, then an 11 percent drop in BMI after 1 year would be equivalent to a BMI of 32.1, and likewise a 7 percent drop would be equivalent to a BMI of 33.6 at the end of year 2. This is, of course, not a valid transposition. If you are confused about the meaning of the results, then join the club. The main point is that people lost what looks like to be an insignificant amount of weight in year 1, that they gained some of it back in year 2, and that there was no difference between the two diets. By the way, the research design was supposed to compare an Atkins-like low-carb diet with a low-fat diet. However, anyone familiar with the Atkins diets would immediately see that the 20 grams per day of carbs for the 2-week Atkins induction phase was carried out for an additional 2.5 months in this study. Those poor people! They had a 3-month induction phase. Hmm. More confusion here. Finally, the low fat diet had an oddity. 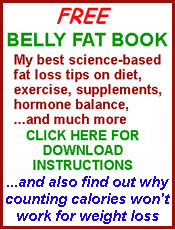 Fat calories were supposed to be 30 percent or less of the total daily calories (i.e., 1200 to 1800 calories per day). This is NOT a low fat diet! In fact, if I recall correctly, this is the recommended amount of fat calories in Barry Sears’ Zone Diet, which was not touted as low fat. In the immortal words of Gomer Pyle, “Surprise, surprise, surprise!” The authors concluded that – DRUMROLL – “Successful weight loss can be achieved with either a low-fat or low-carbohydrate diet when coupled with behavioral treatment.” Fancy that. A psychologist who specializes in behavioral modification for treating obesity finds that to be exactly what people need. Wow! Oh, by the way, that stuff about the low carb diet and cardiovascular risk factors is just a bunch of bunk based on decades-old myths about diet and heart disease. Risk factors are measured as a way to imply cause and effect, and none of the factors in this study cause any health problems at all. This is a huge topic in itself. I will just say for the moment that the importance of these so-called risk factors is that they can be treated with prescription drugs that bring in enough money to prop up a gigantic drug industry. In addition, Annals of Internal Medicine allows comments online for each article. I have taken the entire text from two of these. The first one is by Dr. Dean Ornish, the guru of low fat diets. He makes some very good points. It is important to measure coronary heart disease, not just risk factors, which can be misleading. A recent study found that an Atkins- type diet “promotes atherosclerosis through mechanisms that do not modify the classic cardiovascular risk factors” such as HDL” (1). Other studies also showed that measures of heart disease, not just risk factors, worsened on an Atkins diet, including myocardial perfusion, flow-mediated vasodilation, and inflammation but improved significantly on a low-fat, whole foods, plant-based diet (2,3). No published study has ever shown that an Atkins diet prevents or reverses the progression of coronary heart disease. In contrast, a whole foods plant-based diet much lower in fat than used in this study (10% vs. 30% fat) can reverse coronary heart disease,(4) beneficially affect the progression of prostate cancer, and even improve gene expression and telomerase despite reductions in HDL. It would be unfortunate if people are discouraged from making these diet and lifestyle changes because they incorrectly believe that an Atkins-type diet can provide comparable benefits (5). The authors reported an overall significant decrease in LDL in the low-fat diet and a rise in HDL in the Atkins diet. Other risk factors were not significantly different. LDL is strongly linked with coronary heart disease, but not everything that raises HDL is beneficial. HDL is part of reverse cholesterol transport. When you eat more saturated fat and dietary cholesterol, your body makes more HDL to remove it. Eating a stick of butter will raise HDL, but butter is not heart- healthy. Pfizer discontinued a study of its drug, torcetrapib, which raised HDL but actually increased risk of cardiac events. A low HDL in the context of a healthy low-fat diet has a very different prognostic significance than a low HDL in someone eating a high-fat, high-cholesterol diet. It’s not low-fat vs. low-carb. Atkins- type diets may have some benefits because the typical American diet, and many low-fat diets, are very high in refined carbohydrates. Even better is to consume a diet that is low in refined carbohydrates as well as low in saturated fat, trans fats, and animal protein, includes beneficial fats such as omega-3 fatty acids, and high in fruits and vegetables in their natural, unrefined forms. 2. Miller M, Beach V, Sorkin JD, et al. Comparative effects of three popular diets on lipids, endothelial function, and C-reactive protein during weight maintenance. J Am Diet Assoc. 2009;109:713-717. 3. Fleming R, Boyd LB. The effect of high-protein diets on coronary blood flow. Angiology. 2000;51:817-826. 4. Ornish D, Scherwitz L, Billings J, Brown SE, Gould KL, Merritt TA, Sparler S, Armstrong WT, Ports TA, Kirkeeide RL, Hogeboom C, Brand RJ. Intensive lifestyle changes for reversal of coronary heart disease Five- year follow-up of the Lifestyle Heart Trial. JAMA. 1998;280:2001-2007. 5. Ornish D. Was Dr. Atkins right? Journal of the American Dietetic Association. 2004;104(4):537-542. I am unfamiliar with the name of this doctor. However, as you can see below, he also makes some very good points. In their article (August 3 issue) (1), the authors report that a successful weight loss can be achieved with either a low-fat or low- carbohydrate diet when coupled with behavioral treatment. This was a randomized control trial looking at the effects of 2-year treatment with a low-carbohydrate or low-fat diet, each of which was combined with a comprehensive lifestyle modification program. This is a well done study with a good job in randomization and study design. This study build upon the results of an earlier study published in NEJM (2) comparing the weight loss with low carbohydrate and low fat diets at the end of 2 years (this is the only 2 year randomized controlled trial that has been published before the current study). Even though the two studies differed in study setting, patient samples etc., we can still draw some comparisons. The NEJM study found greater 2-year weight loss with a low carbohydrate diet than low fat diet, unlike the current study. The study reported mean weight losses of 5.5 kg and 3.3 kg among low carbohydrate diet and low fat diet respectively. However, the current study reports approximately 7 kg weight loss among both the groups. The authors mention that even though low fat diet traditionally has associated adherence problems, the difference in adherence may be overcome by comprehensive behavioral treatment. However, the authors have failed to comment upon one very important variable. What was the level of physical activity at baseline among both groups and what was the change at 3, 6, 12 and 24 months? Without this information, it is very difficult to draw concrete conclusions from the current study. Another issue that needs clarification is whether the two groups were similar in terms of hormonal replacement therapy (HRT). The authors mention: we excluded study applicants if they…took medications that affect body weight, including antiobesity agents. Did the list of medications include HRT, since HRT affects lipid profile (3). This issue is all the more important since two-thirds of the study sample consisted of females! The same concern I have is for smoking status among both the groups, since smoking can affect lipoprotein concentrations (4). The authors have not reported smoking status among the two groups. Overall, the findings of the study are quite interesting but in the light of the above facts, readers need to apply caution. 1.Foster GD, Wyatt HR, Hill JO, et. al. Weight and metabolic outcomes after 2 years on a low-carbohydrate versus low-fat diet: a randomized trial. Ann Intern Med. 2010 Aug 3;153(3):147-57. 2.Shai I, Schwarzfuchs D, Henkin Y, et. al. Weight loss with a low- carbohydrate, Mediterranean, or low-fat diet. N Engl J Med. 2008 Jul 17;359(3):229-41. 3.Walsh BW, Schiff I, Rosner B, et. al. Effects of postmenopausal estrogen replacement on the concentrations and metabolism of plasma lipoproteins. N Engl J Med 1991 Oct 24;325(17):1196-204. 4.Freeman DJ, Griffin BA, Murray E, et al. Smoking and plasma lipoproteins in man: Effects on low density lipoprotein cholesterol levels and high density lipoprotein subfraction distribution. Eur J Clin Invest 1993 Oct;23(10):630-40. I am tempted to say that the original article was a waste of taxpayers’ money on a study that provided no new information. Oops, I guess I just said it. I am still amazed that so much research funding goes to such weak studies. Of course, long ago I learned that at least 95 percent of all scientific publications were seriously flawed. It stems from the rampant misuse of the scientific method. That is another soapbox for another time. Of course, on further inspection of the underlying research, that headline was way off the mark, wouldn’t you say?